Seed for Change: When will I get my schoolbag? Two weeks have passed since I arrived in Delhi airport and I met Maria, who had come to welcome me. Two weeks. Let me introduce myself. I am Vanessa, the volunteer who, for 4 months, will be honoured to share with you everything that Seed for Change does in Varanasi, this city of contrasts. I arrived in Delhi with the tiredness of fourteen hours of journey and a few sleepless nights. As soon as I set my foot on this land, everything sped up. Time seemed to move faster, a minute would encompass so many things that there was always something that slip past me. After a long journey by train, I entered Varanasi with the feeling that I had gone back in time, in history. Thousand-year-old temples washed by the growing Ganges waters, narrow alleys ruled by holy cows, children and men immersing their sins in waters conquered by the ashes, the smell of smoke, the smell of extintion, bright colours, grey looks, sounds, a thousand sounds... I felt captivated. I longed to catch it all. Once I found my way on the streets, I gradually got to know the people. As we were recording for the Spanish TVE program Acción Directa, we made our way towards the suburbs of Sigra, where the families welcomed us at their colonies with a smile and offering us the little they have. For a second, I could imagine myself living under those canvasses, piling up the rags that many of the children are compelled to pick up from the streets to support their families. I could imagine myself walking barefoot on the mud brought about by the frequent monsoon rains, taking care of my siblings, burning plastic bags in order to cook some rice in an old clay oven and living under the oblivion and empty looks of many people around me. And it was there, surrounded by rubble, when I realised how hard it will be to fight for the future of these children. Seed for Change opts for the key to their development: education. These weeks we moved around Sigra, in search of the best school for the suburb children, who will start in our educational program from October. The inhabitants of the colonies are known as the 'untouchables', a word that I find hard to digest in reference to any human being. Nobody wants them near, they prefer to ignore them. It is most shocking to find such a degree of discrimination among casts, that made us search for a school that is not too closeby to their homes, in order to avoid any mockery or offence by their future classmates. They were long days of travelling by rickshaw, dodging puddles, cows and touring paths full of potholes. At the end each and every one of our muscles were exhausted from being alert to a likely fall. Having found the suburb, we interviewed every family. 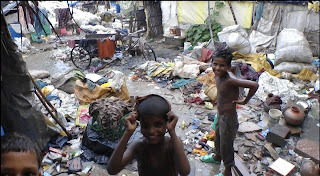 We took cover from the sudden rain under their leaking roofs as they told us their stories. Some showed more interest and motivation to educate their children, whilst others only approached us out of curiosity. We talked to families whose incomes seldom reach 100 euros per month and have 7 to 9 mouths to feed. Many of them with a household head that, after 12 hours of hard work cycling to transport 150 Kg, would spend on alcohol most of his earnings. Each of the stories are different, but all within the limit of poverty. After finishing all the interviews and wandering around the area, we found the school that best matched the policy of our program: quality education. Once an agreement was signed, interviews of the families in the school were to take place. This encounter is still pending for next week. These have been days full of tension for the inhabitants of the colonies. In Varanasi there was a feeling of fear, due to the verdict about a holy place that has been unresolved for over 50 years, leading to struggles among muslims and hindus. 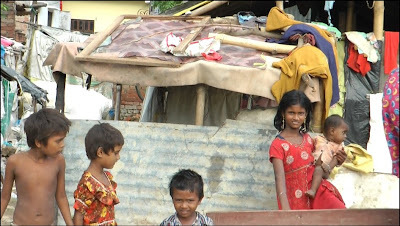 At the suburbs of Sigra, where families are of muslim origin and there is a high level of illiteracy, the conflict heightened, causing the temporary departure of children and women to their home villages in West Bengal. They will be back in a few days. Until then, the interviews are postponed. The moment had been awaited for days, every detail thought of so that each of the mothers would enjoy the encounter... and finally the date came. They gradually arrived, punctual, in their best dresses, some in the company of their children, also smart looking with their hair combed and oiled. Firstly they timidly smiled, hiding behind gestures of uncertainty, sitting down trying to cause a good impression. As the premises of Seed for Change were filled up with the mothers and their complicit looks, the silence was broken. Maria welcomed all with a short speech in Hindi which put a smile on the faces of the audience. The talk was carried on by the school director and the coordinator, who for three hours kept the attention of the mothers, by now more and more aware of the importance of the meeting. 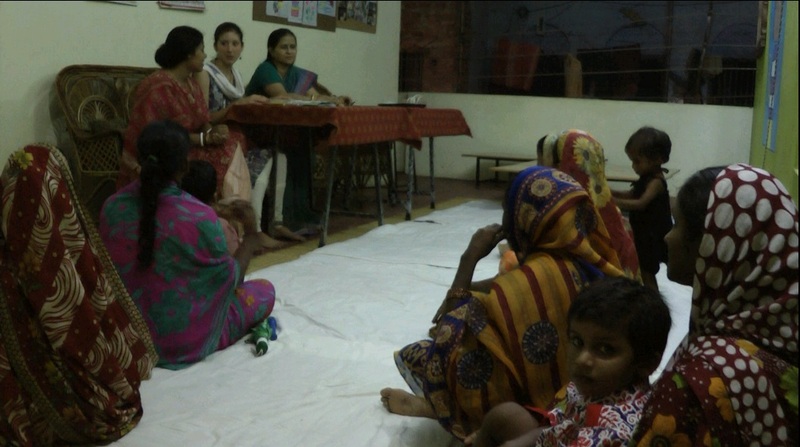 After covering subjects of vital importance for the health and school progress of their little ones, the encounter became an open space for dialogue, where the mothers' satisfaction and confidence were apparent. Thankfulness could be felt in their gestures and in their eyes. And this was shared with a nice dinner with their delight and our complacency. Now another such filled-with-complicity moment is awaited . From now on, it will happen on a regular basis. It is half endearing and half scaring to see a girl of 3, with the looks of a 1 and 1/2 year old, with such a swollen belly that does not let her see her own feet. Mamta had us worried. Always with a lost look, an attitude of an adult, a sobbing that so touched us. We walked for almost half and hour, with their mothers holding the weight of the little ones on their backs, until we reached one of the dispensaries that the French NGO with which Seed for Change has an agreement. 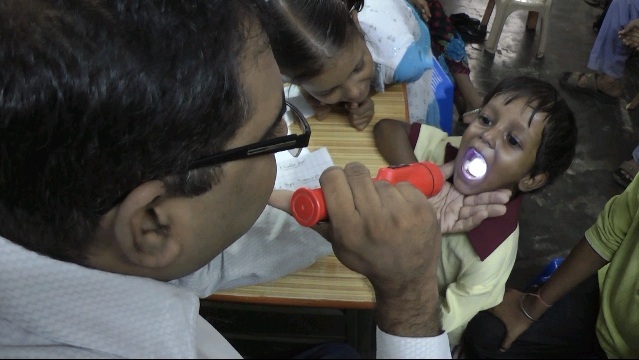 The children were examined by a doctor who detected mostly cases of worms and some infections, for which medicines prescribed turned out to be most effective. It is now indescribable to see that girl laughing, walking forward with clumsy steps when going to play, speaking broken words in English in an attempt to imitate her older brothers studying their lessons or eat a good plate of rice whilst talking to herself. Even so, her full recovery will be in the long term. 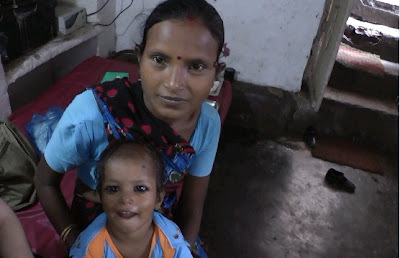 To help her progress,medical check-ups will be carried from this month onwards. For the families' convenience and to avoid the long way which can only be covered on foot, Seed for Change agreed with Dr Yogesh Tripathi to have the medical check-ups once a month at the organisation premises, which are located nearer to the families' homes. This way, an exhaustive control over each child will be possible and soon the vaccination treatment will also take place. These have been two intense weeks of hard but worthwhile work. The humid heat that is felt in the city is an add-on, not an obstacle. To put an end to the first post, I would like to share with you good news. We have new sponsors! We will inform you shortly about the lucky children, some of them already impatient to start the lessons. A picture stayed on my mind about one child from the Sigra suburbs who was asking us where her schoolbag was, showing her eagerness to start school. It won't take long.